By this I do not mean that there is in contemplation, or required, any change in our fundamental institutions. I mean, rather, that we are beginning to reap the rewards which accrue from the existence of those institutions and our devotion and loyalty to them. Some principles are so constant and so obvious that we do not need to change them, but we need rather to observe them. The world is fairly well agreed on the probable permanence of the first four tables of the arithmetic with which I struggled when I attended the district school. It is not thought that they need to be changed, or that we can make any progress by refusing to apply them. Those who seek to evade them in the ordinary business and procedure of life would undoubtedly find that such action would work either to the ruin of any commercial enterprise, or if it did not, the beneficiaries of such a disregard of the commonly accepted rules of addition would undoubtedly find that a very large majority of people would be old fashioned enough to charge them with fraud. The institutions of the Government and society may not always be susceptible of a demonstration which is as exact as those of mathematics, but nevertheless political relationship is a very old science which has been set out in theory and wrought out in practice through very many centuries. Its fundamental principles are fairly well established. That there could have seen gathered together a body of men so learned in that science, so experienced in its application, so talented and so wise in its statement and demonstration, as those who prepared, formulated, and secured the adoption of the American Constitution, will never cease to be the wonder and admiration of the profoundest students of Government. After making every allowance for a fortunate combination of circumstances and the ac complishments of human ingenuity, they have been nearly all forced to come to the belief that it can be accounted for only by the addition of another element, which we must recognize as the guiding hand of Providence. 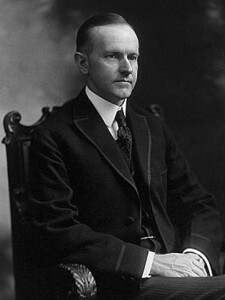 As we can make progress in science not by the disregard, but by the application of the laws of mathematics, so in my firm conviction we can make progress politically and socially, not by a disregard of those fundamental principles which are the recognized, ratified and established American institutions, but by their scrupulous support and observance. American ideals do not require to be changed so much as they require to be understood and applied. It was only as this work was accomplished, as these instruments were provided, these properties built, and these possessions accumulated, that there could be a reduction in the hours of labor, an increase in the rewards of employment, and a general betterment in those material conditions which result in a higher standard of living. The leisure for culture had to be secured in this way. Servitude of all kinds is scarcely ever abolished unless there is created economic opportunity for freedom. We are beginning to see that the economic development of our country was not only necessary for advancing the welfare of the people, but that we must maintain an expanding power of production if that welfare is to be increased. Business makes a most valuable contribution to human progress. As we look back upon all this development, while we know that it was absolutely dependent upon a reign of law, nevertheless some of us can not help thinking how little of it has been dependent on acts of legislation. Given their institutions, the people themselves have in the past, as they must in the future, to a very large degree worked out their own salvation without the interposition of the Government. It is always possible to regulate and supervise by legislation what has already been created, but while legislation can stimulate and encourage, the real creative ability which builds up and develops the country, and in general makes human existence more tolerable and life more complete, has to be supplied by the genius of the people themselves. The Government can supply no substitute for enterprise. Oh man that’s good presidentin’. For the most part our institutions are attacked in the name of social and economic reform. Unless there be some teaching of sound economics in the schools, the voter and taxpayer are in danger of accepting vague theories which lead only to social discontent and public disaster. The body politic has little chance of choosing patriotic of ficials who can administer its financial affairs with wisdom and safety, unless there is a general diffusion of knowledge and information on elementary economic subjects sufficient to create and adequately to support public opinion. Every one ought to realize that the sole source of national wealth is thrift and industry, and that the sole supply of the public treasury is the toil of the people. 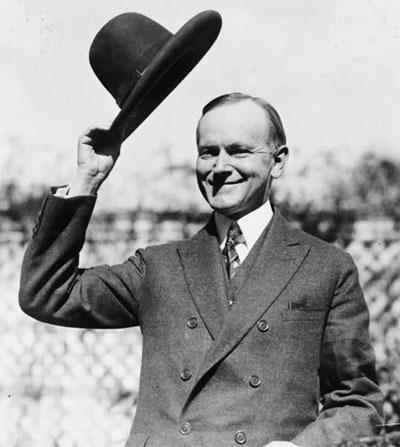 Coolidge would be horrified to see what has become of his beloved nation today. Does anyone understand that the sole source of the wealth of the country is “thrift and industry” anymore? Does anyone connect that all that massive spending that happens in Washington D.C. rests on the backs of the people? Do young people graduate from high school (or even college) with a basic grasp of economics? If so, why is personal indebtedness so high? Why do we consistently vote for politicians who see no problem with massive deficits and debt?